As a good friend to fellow veterans and their families... with providing assistance to veterans to help them secure their military benefits, as well as supplying emergency financial aid to veterans in need. As a good neighbor to the local community... donating and delivering house slippers to veterans in nursing homes, and donating to other charitable organizations like Toys for Tots. We provide free assistance to Veterans and their families in obtaining benefits and service earned through military service as provided by the Department of Veterans Affairs (VA) and any other applicable government agencies. Several of our TVFV members have undergone special Service Officer training to fully understand how to assist you with this process. One of our service officer volunteers will meet with you and act as a liaison during this process. 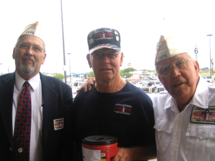 On a case by case basis, we consider veterans who have financial need they are unable to meet. On occasion, veterans who are waiting for their military benefits to be funded may find it difficult to take care of their mortgage, rent, utilities and other personal responsibilities. If their situation is approved, the TVFV offers small grants to the veteran to take care of those needs. Working with a local shoe manufacturer, the TVFV collects, sorts and then re-distributes house slippers to veterans in nursing homes. Each holiday season, the TVFV may offer a donation to a local charity, such as Toys for Tots.